Ricker, an American skipper, recoverd from his waist sprain at Sanya Chinese Medicine Hospital. He spoke highly of the ‘miracle’ Chinese traditional treatment when he left the hospital on the morning of 21st February. Ricker sprained his waist while riding waves on a luxury yacht passing through Sanya seas. At first, he thought it was only a slight strain, but he felt pain all over the body and he couldn’t move the following day. He was delivered to the Sanya Chinese Medicine Hospital after a clinic found he needed more advanced treatment. 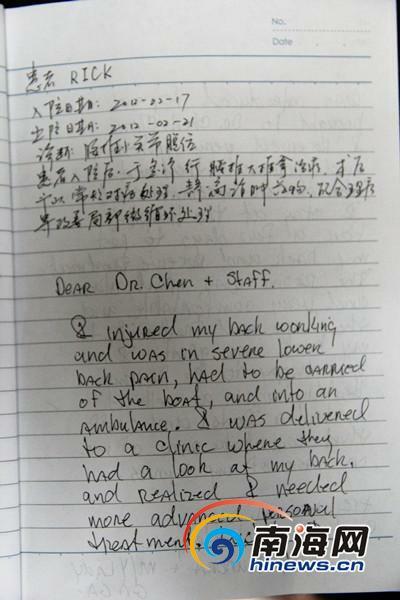 Ricker felt painless the following day and he got well enough to move about after 4 days with traditional Chinese characteristic physiotherapy. The skipper said he didn’t know anything about TCM before, and he learnt about it due to the unexpected waist sprain. “Very good!” He spoke highly of TCM and wrote a thank you letter to the Sanya Chinese Medicine Hospital.